BIN2DEC: Binary to Decimal: Now allows for any size (up to memory limit). Input: A list of bits (zeroes and ones). Power of 2 is in descending order from 2^(D-1) to 2^0 where D is the length of the list. Output: List of binary bits. Power of 2 is in descending order from 2^(D-1) to 2^0 where D is the length of the list. DRAWICON: Draws a 5 × 5 pixelated pictures using an integer from 1 to 33,554,431. The number is converted into its binary bits. 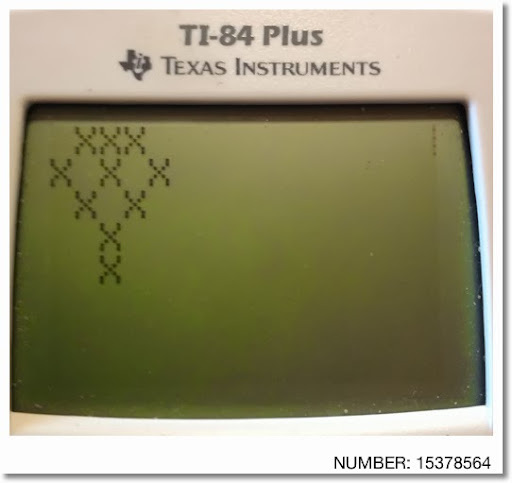 The upper left hand corner represents 2^24. 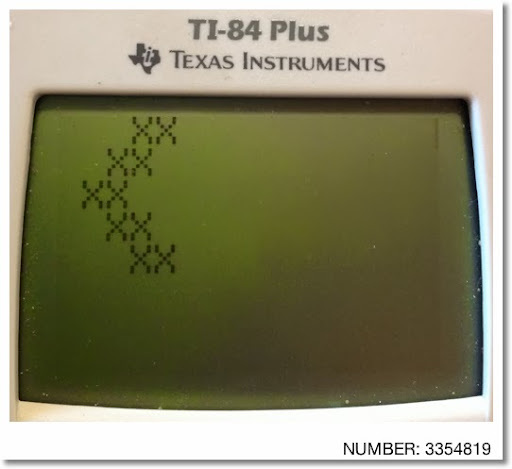 The exponent decreases going right then down each row, with 2^0 representing the bottom right hand corner. This formula calculates the day number of any date (given month and day). A 365 day year is used. If you are operating with a leap year with dates after February 28, add 1. Hence in non-leap years, January 1 is Day 1, February 1 is Day 32, etc..., December 1 is 335, and December 31 is 365. To find the day number, use the above formula to get the "Gregorian" day number (better term?) for the date in question and subtract the "Gregorian" day number for January 1. This gives the number of days between January 1 and said date. Since the days between dates does not include January 1, we need to include January 1 by adding 1. For derivation purposes, let's calculate the days between January 1, 1 (AD) and target month and date of year 1. Add 1 to include January 1. I arbitrary chose 1 as the year for ease of calculation and the "year 1" would have been a 365 day year. For leap years, add 1. Here it is in RPN format. I broke up some of the larger numbers into an addition of two smaller ones and used flags to keep the program within one label. B, D, and F are pairwise co-prime. B and D have a GCD of 1, B and F have a GCD of 1, and D and F have a GCD of 1. The program returns the solution X ± n*(B*D*F), X is the smallest positive integer and n is an integer. : Disp "X=A MOD B"
: Disp "X=C MOD D"
: Disp "X=E MOD F"
Major thanks to Dr. Cliff Pickover for posting the link to this awesome video on my Twitter feed. On January 9, 2014, Danica McKellar premiered her YouTube show "Math Bites". The first show is all about pi (π). OK, they talk about pie too, but the main focus is one the famous number. From memory, I know π = 3.14159265353897923846... (I think that's right). Anyway, click on the link and enjoy! And not only my favorite number is π, my favorite pie is apple, especially if it has cinnamon with a crust on top. And I have a Twitter account too, mine is @edward_shore. Next post will be post the 300th of this blog! Again, I thank you for your support - much appreciated. Happy Mid-January! Enjoying the first full moon of 2014? No pre-storing any variables required. If there is no solution, an error is produced. I am working on a program for the Chinese Remainder Theorem for 2 or 3 linear congruence equations, to be posted soon (hopefully). Background boxes with falling water. There is random mist coming from the water. I realize this is more a picture one would see when running an Atari 2600 game. 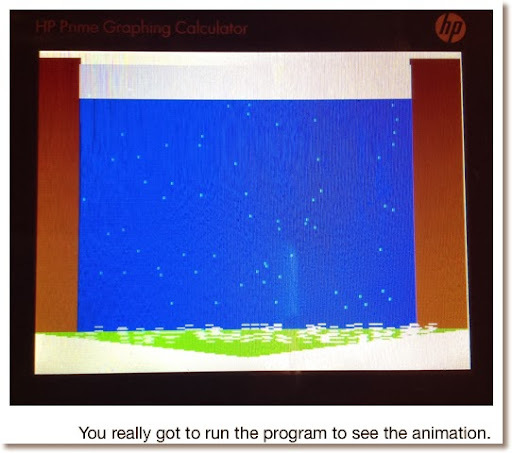 I guess the point is how to layer graphics so that the static elements are drawn first, then the animated elements. Given the lines of various length from a single vertex and the angles between the lines, the area of the field can be calculated. The result is a list of two elements. Angles measured with a protractor. So, realistically, my estimate of area is rough. Note: CHAR(10) gives a line break in a string. Honestly the name of the object presented on this blog entry is made up names because I don't think there is an official geometrical name. This was inspired by trying to find areas of baseball fields. Hopefully this provides inspiration and maybe insight. Description: A triangle with line segments splitting away from each other at an 90° angle. After a certain distance, where the triangle stops, and half-ellipse is attached at the end. B = length of a segment from the vertex to the outer point of the half ellipse. This line divides the shape in symmetric halves on each side. 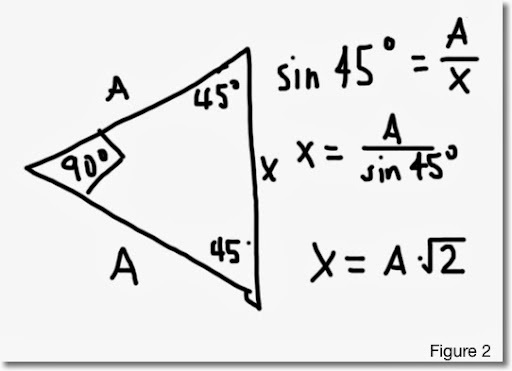 Then from trigonometry, sin 45° = A/X which implies that X = A*√2. This will come in handy for part (II). π * length of the semi-major axis * length of the semi-minor axis. 1/2 * π * length of the semi-major axis * length of the semi-minor axis. I am not worried whether which of the axis is the major and which one is the minor. I am going for a general formula. 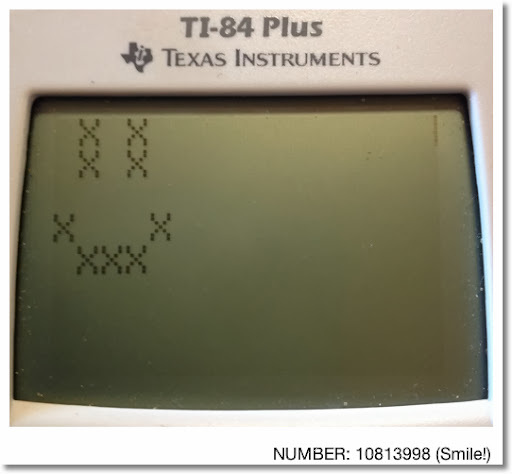 From Figure 2 above, X = A*√2. This is one of the axis. Half of this length is 1/2*A*√2. Break the length B into two parts. Let Y be the length of the line segment from the vertex to the end of the triangle. 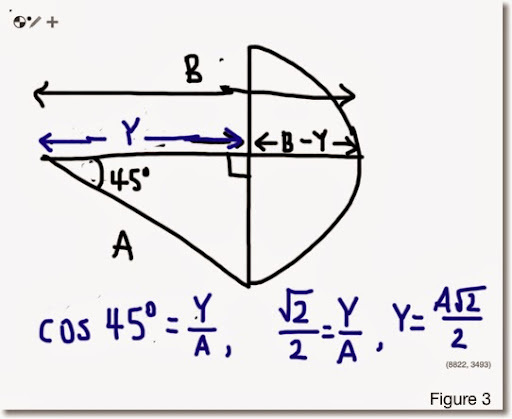 For finding the area of the half ellipse, we want the quantity B - Y, which represents the length of one of the semi-axis. 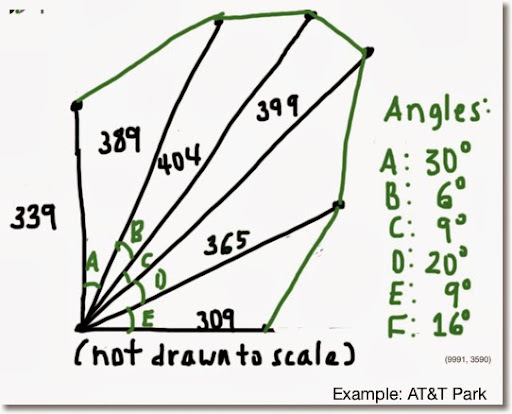 The line bisects the 90° angle into two 45° angles. Using trigonometry, Y = A*√2/2. Hence, our semi-axis length is B - Y = B - A*√A. 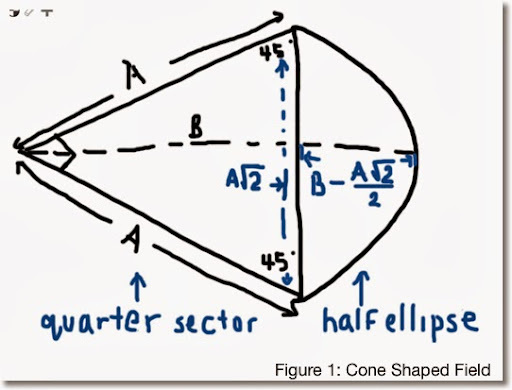 The take away point is that if you have an unusual shape and if you can recognize at least parts of familiar shapes, you can come up with a fairly closed formula for calculating the area for that shape. Until then, have a great day and get creative! The number of possible combinations is fairly easy to calculate. You multiply the number symbols each slot has together. For example for a three slot machine with six symbols a piece, the number possible combinations is 6 × 6 × 6 = 216. Although I have never played on one (knowingly), you could have a slot machine were each slot itself has a different amount of symbols. Let us look at analyzing a pair of slot machines. For this blog entry, we will assume that the slot machine has one line and takes only one coin per roll. (I): There is only one configuration for this: three Jokers. (II): Three of a kind that isn't a Joker. One the first slot, you can get any of the five fruit (apple, orange, lemon, banana, melon). Once that fruit is selected, that fruit has to match on the next two slots. So, there are 5 such combinations: three apples, three oranges, three lemons, three bananas, and three lemons. 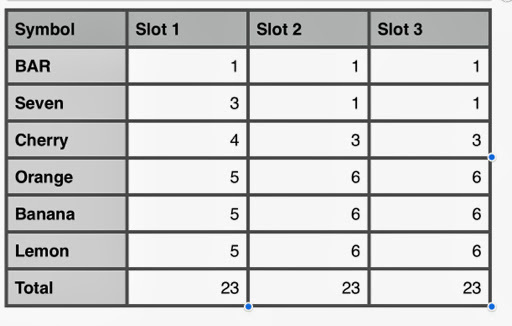 (III): Jokers can appear any two slots: slots 1 and 2, slots 1 and 3, and slots 2 and 3. The other slot must contain fruit. Hence the total number of winning combinations possible is 1 × 1 × 5 + 1 × 5 × 1 + 5 × 1 × 1 = 15. (IV): Jokers can appear in any slot, the other two slots must have fruit. In this instance, it does not matter if the other two slots match. The number of combinations is 1 × 5 × 5 + 5 × 1 × 5 + 5 × 5 × 1 = 75. There are a total of 1 + 5 + 15 + 75 = 96 winning combinations. 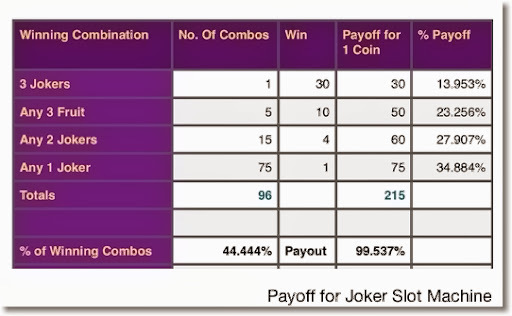 The table below shows the calculation of slot's payout. The payoff percentage is 99.537%. That is pretty good in terms of slot machines. It could be a little misleading given that the harder combinations are given more weight. 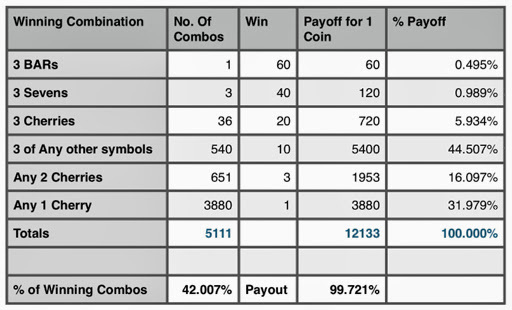 Had everything paid equally, only 96/216, or about 44.444% of the combinations would win. I doubt no one would play a slot machine with less than a 50% chance of spinning a winning if there was no added incentive, such as a richer payoff. There are 23 symbols per slot. 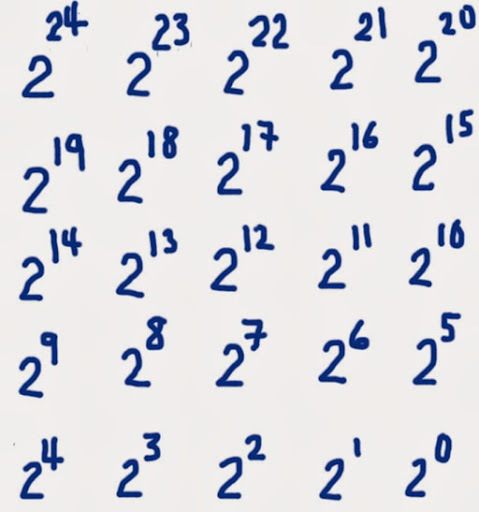 So the number of possible combinations is 23 × 23 × 23 = 12,167. Also note that the non-equal distribution of symbols on each slot. With the lack of BARs, cherries, and Sevens (7), it is obvious that getting winning combinations involving these three symbols offer higher playoffs. (III) 3 Cherries. Wins 20 coins. This second table has a payoff percentage of 99.721%. If everything paid 1 coin equally, it would drop to just over 42%. For more complex slot machines (more slots and multiple lines), the use of a spreadsheet or other computer program will come to the aid of calculating payoff since the number of calculations grow with complexity. 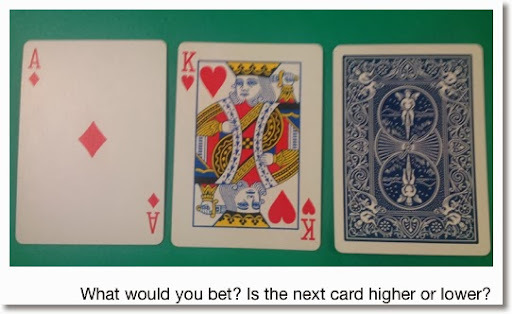 In the classic game "Card Sharks", contestants had to guess and wager whether the proceeding card is higher or lower. The card game is popular to watch on TV and to play on yourself. All it takes a deck of cards to play. 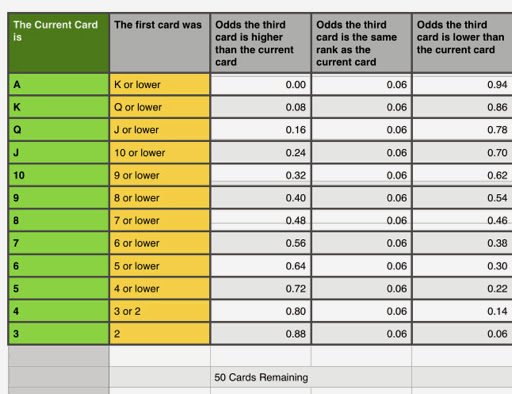 This blog entry deals with the odds of whether the next card is higher or lower. 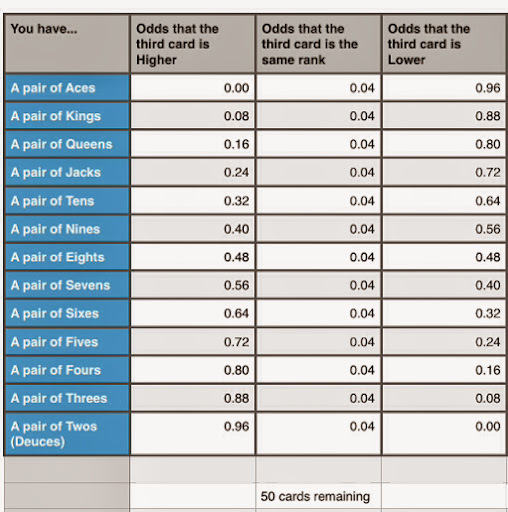 Several assumptions: the odds are calculated with a standard 52 card deck without Jokers. The tables deal with the first cards drawn from the top of the deck. 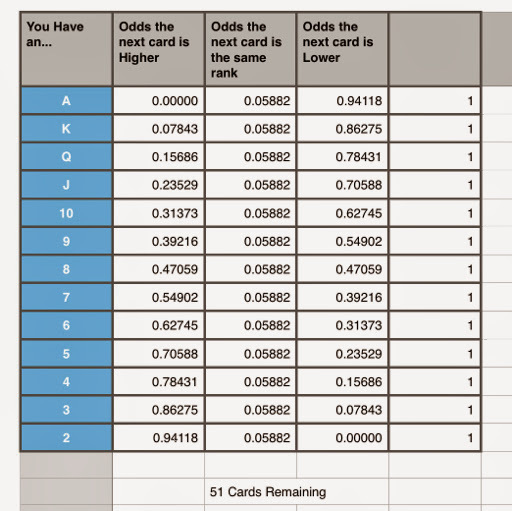 Table 1: One card is drawn from the top of the deck. Table 2: One card is drawn. A second drawn which is lower than the first card. Examples: Ace then King, Ten then Six. The second card is the current card. Table 3: One card is drawn. A second drawn which is higher than the first card. Examples: King then Ace, Six then Ten. Table 4: A pair of cards are drawn. Example: A pair of Eights. 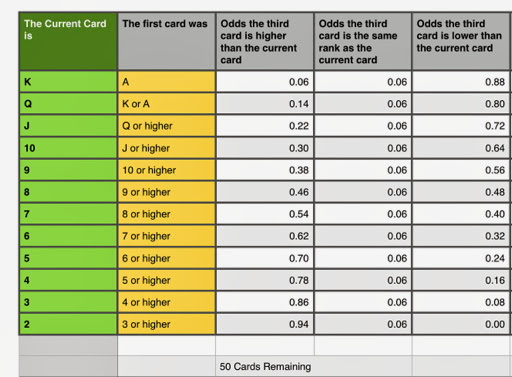 In general, the odds of whether cards are higher or lower as the number of cards decrease. Let's see how the odds change during a 8 card hand. ** Odds are rounded to 3 digits in this analysis.